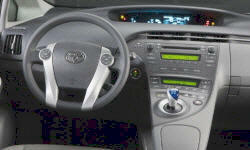 Toyota Prius Pros and Cons | Page 1 of 8 | Why Not This Car? Getting 4.3 l per 100 km overall on first 5,000 km. Great value in Canada as price is same in dollars as US. Handling is much improved, power is good and fuel economy is incredible. vey good on gas it cost less than $300 tto drive from california to georgia just about. very reliable car last way over 200000 miles n still runs the car is very quiet you cant even tell the engine is eever on this car been through so so much its crazy it still runs. The Prius is a great and cheap car to run! Never got less than 40 MPG. Up to 50 so far. I'm one of those guys that normally don't buy small cars (too small). Or Toyotas (no soul). But a car that has room for 5, get fantastic fuel mileage & will do so for 250K - that's a keeper. 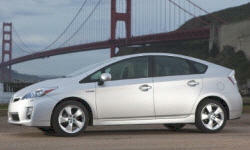 Between the fuel savings, low maintenance, and long life, the Prius is the cheapest car you can get. The dash layout and the middle arm really annoyed me. The trip computer was dead center of the dash, not the place I want my eyes while driving down the road. The gas mileage of the Prius is unbeatable. With the price of gas climing at the pump it was time to buy the Prius. It is awesome, gets much better with extended city driving. Prius... What more an I say. Its very consistent. If I pay attention to how I drive it generally returns an average of 42-44 mpg (city). On long trips if you have a tail wind the mileage can easily get up to 60+ mpg. All that without any kind of hyper mile behavior. Using less fossil fuel with this Super Ultra Low Emissions Vehicle makes it the cleanest vehicle available in South Africa.